The antics of the artists and the corporate boardroom of Marvel if it’s true according to Sean Howe’s Marvel Comics: The Untold Story is as exciting as the battles between superheroes and villains. Before Avid Arad and and Kevin Feige emerged into the scene, it’s Martin Goodman, a self-made publisher of pulp magazines that started the comics business. With the help of his relative, a certain guy named Stanley Martin Lieber later called himself Stan Lee and a World War II veteran, Jack Kirby created the first issue of Fantastic Four, a team of superheroes combating internal conflicts and baddies simultaneously. It turned out to be a huge hit and the rest they say is history. But Howe is not content is giving us the plain genesis of Marvel, in great detail he recounts the subsequent transforming of the million dollar business, changing from one hand to another. But it’s the passion and love of the art form from the people who create them that keeps it going from one generation to another. The numerous struggles of the lowly-paid artists and editors who spent most of their lifetime churning out issues and issues of comic mayhem for the readers are the ones at their most disadvantaged. Of course it goes without saying, the main bulk of money went back to the owners’ pockets than those who toiled day and night. Howe describes in great detail the issue of royalties, notorious copyright amounting to the late Kirby’s original works, his disagreement with Stan Lee over the decades as to who is the original creator to the numerous characters they co-created and notably the frequent fights between editor and artist through a complex hierarchy. The frequent decamp by the staff at Marvel to DC and vice versa become a recurring fact with the subsequent setting up of independent labels by disgruntled employees being mentioned as well. Yet despite the often tension, there is still some fun moments happening in the original Marvel Bullpen in the 1960’s as mentioned in the book. It’s not just about comics that it’s touched on. For that, Marvel’s years of unsuccessfully foray into Hollywood is also included though the book stops short of giving us details for events happening after 2001. Quite a pity considering Howe already spent a huge amount of his book spanning from the 1950’s to the 90’s but decide to give a fleeting account of the current scene towards the end especially the setting up of Marvel Studio and the subsequent purchase by Disney. 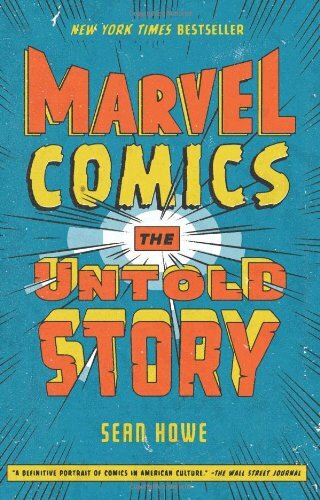 In conclusion in spite of the occasional bloating, Howe’s recounts of Marvel’s history is painstakingly researched and detailed in his 400+ pages book and for any Marvel and comic fan alike, this is the perfect Christmas present.